BIOPAC Systems Inc. is a company that produces machines that can test several physiological processes. These include electroencephalography (EEG), electrooculography (EOG), electromyography (EMG), respiratory function, temperature, and heart rate. In addition, they can be used to test grip force! One of BIOPAC’s machines is the MP150. After buying this expensive piece of equipment, you can buy add-on modules to test some of the functions listed above. These modules can be clicked into the MP150, which can then transmit data collected from the module to a computer. BIOPAC offers some software to read out the signal that the MP150 transmits, but you can also program custom scripts to do cool stuff with the MP150’s data. This post will teach you how to write those cool scripts in Python. The demonstrations will rely on the PyGaze toolbox, but communications with the MP150 do not rely on this. So you could use your own favourite experiment package (PyGame or PsychoPy, for example). This example will focus on a dynamometer, which is a module that can measure grip force. It provides a handle that participants can squeeze, which earned it the nickname ‘squeezie’ in our lab. However, as far as I can tell, the presented software should work with any other module too. 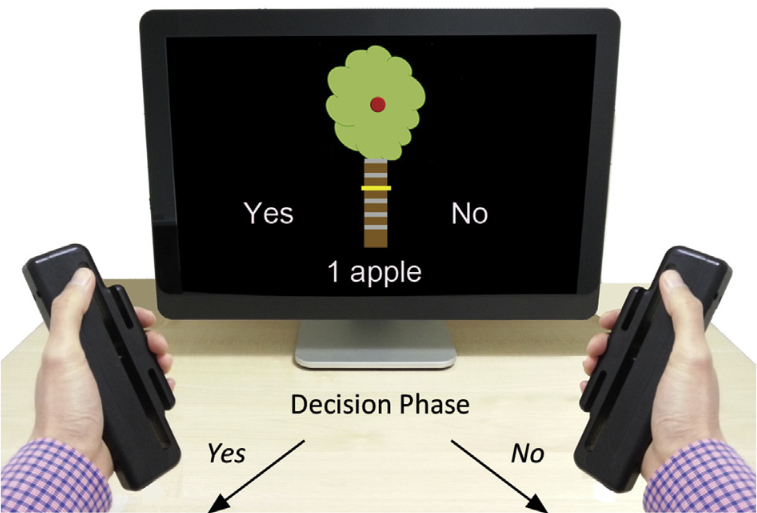 Dynamometers were used in Chong et al.’s study on decision making in Parkinson’s patients. The above image is from Chong et al. (2015), a study that used dynamometers on healthy people, and on Parkinson’s disease patients on and off their medication. They used squeezing the dynamometer as a manipulation of physical effort. They demonstrate that Parkinson’s patients were less willing to invest effort if they could obtain a low reward for it. On dopaminergic medication, patients were willing to invest even more effort than healthy participants when the rewards were high. BIOPAC provides a DLL (a dynamic-link library) that can be used to communicate with the MP150 on Windows (sorry, not other operating systems supported). It’s called mpdev.dll, and you should have gotten it with your system. If not, no worries: you can download it from my GitHub page, along with the other code presented on this page (see the Downloads section below). # The DISPSIZE should match your resolution! # (this ranges between black and bright red). # then you make sure it's an integer between 0 and 255. # Make sure red is between 0 and 255. # Now set the background colour to the new colour. # ...and write the new sample text (white letters). # ...and update the monitor! # Don't forget to check if there is a keypress. This while loop will run until you press Escape. It will show the sample’s value in white letters (on the centre of the Screen, the default text position). And it will update the background to be brighter red if you squeeze the MP150’s dynamometer harder. # Close the connection with the MP150. And that’s it! Your whole experiment finished! For another example, that shows you how to record from the MP150 to a log file, see this MPy150 test script on my GitHub. The MPy150 class is completely free and open source. It is hosted on my GitHub page, from where you can also download it. The download is an archive that includes libmpdev.py and mpdev.dll. To use them, unzip the archive and place the files in your PyGaze directory, or in the same directory as your script. Import MPy150 into your script. BIOPAC, grip force, methods, Python. Bookmark. What units are the samples? I assume kg? That’s a very good question! I’m afraid it’s not kilograms, but more-or-less arbitrary units (I think it’s the voltage output from the module). You’ll have to calibrate your system to know what output values correspond to what pressure, for example by placing a known weight on the handle and reading out the difference in the BIOPAC’s output. I’m a newbie here. How does the code changes if used in Psychopy?